English Cocker Spaniels are sometimes referred to as the 'merry cocker' because of their happy, outgoing nature and none stop tail wagging – which involves wagging the whole of his hind quarters! As a family dog, Cockers make a great choice – they are affectionate, energetic and friendly. They are even tempered with other pets and bonding with all family members, especially children. 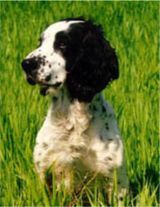 While the larger spaniels where used for springing game, the smaller Cocker was used for hunting in the dense bushes for woodcock – this is how the name 'Cocker' came about. 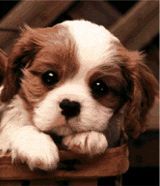 In England and all of Europe, the breed is simply known as the Cocker Spaniel, there is an American Cocker spaniel which was bred from imported dogs from England – this breed is smaller and stockier than English Cocker Spaniels. Our 4 Paw Rating - to the suitability of Cocker Spaniels for your home and lifestyle. 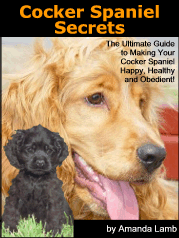 Discover How to make your Cocker Spaniel dog happy healthy and obedient!